Learn how to create a profit-sharing reward program for your household! 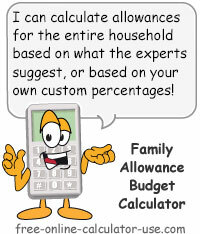 This household allowance calculator will calculate allowances for kids and adults based on either your own preferred percentage split, or on allowances recommended by experts. Simply enter the amount that is over and above your household bills and expenses (surplus), select the period of time the surplus applies to, select the parent-child percentage split, then just click the calculate button and let the calculator do the number crunching for you. 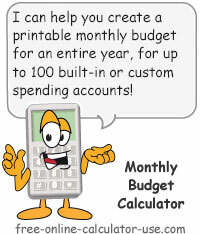 Plus, unlike some other online allowance calculators, this calculator will allow you to open the results in a printer friendly window where you can print out the completed allowance report. 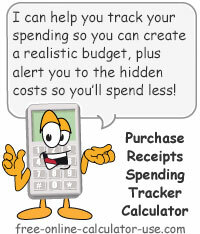 From there, each family member can then use the Cash Budgeting Calculator to set up a budget for attending to their own individual wants. Calculate and budget allowances for kids and adults, based on either your own preferred percentage split, or on allowances recommended by experts. Select the period the budget surplus applies to and then enter the surplus amount. Enter as a dollar amount but without the dollar sign and any commas. A surplus is the amount left over after all essential due and accruing household bills and expenses have been paid and/or funded. Select the Parent:Child surplus percentage split. The number to the left of the colon is the parent/adult percentage, and the number to the right of the colon is the child percentage. For example, if 75:25 is selected, 75% of the surplus will be divided up between the parents, and 25% will be divided up between the children. If you want to only disburse the surplus to your children, select 00:100. Select the number of parents in the household. If 2 parents are selected, the parent surplus will be divided up equally between the 2 parents. Select the number of children in the household. This will load an entry form row for each child in the section below. 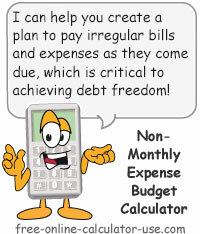 Name: Enter the name of each child you want included in the allowance for kids calculations. If you prefer not to use real names, feel free to enter nicknames. The name field will need an entry in order for the row to be included in the calculations. Age: Enter the age of each child. The age will need an entry in order for the row to be included in the calculations. %: This is an optional column to be used if you prefer to set the percentages for each child yourself. Note that the entered percentages must add up to 100 in order for the calculator to use this column in its calculations. Otherwise, the calculator will use the age of each child to determine a percentage based on what most experts believe to be optimum for each age. This field keeps a running total of your allowance percentage entries as you enter them for each child. If the total is not equal to 100, the entries in the percentage column will be ignored. Enter the amount of your household budget surplus, and then select the time period it applies to. Select the preferred parent/child split ratio. Select the number of parents/adults in the household (1 or 2). Select the number of children in the household. The calculator will create an entry row for each child. Enter the name, age, and optional percentage for each child. When you are satisfied with your entries, press the "Calculate Allowances" button. This will display a household allowance chart showing who gets how much, the weekly, monthly, and annual totals, plus a button to create a printer friendly report. How to use allowances to create a household profit sharing plan. If you have yet to create a household budget, you will first want to visit either the Free Personal Budgeting Calculator or the Monthly Budgeting Calculator in order to determine the amount of the surplus to enter into the allowance calculator. If you would like to get an idea on what other working families in your region spend for essentials, I recommend trying out the Working Families Budgeting Calculator located on the Economic Policy Institute (EPI) website. A recent study conducted by Citibank revealed that in 57% of divorces, disagreements over money was stated as the primary reason for the divorce. This means that if families want to stay together then they must make sure that open and non-defensive communication about money is a regular occurrence within the household. In my experience, families that are most susceptible to financial break-ups are those wherein one or both of the parents knowingly or unknowingly impose their individual wants and wishes on the entire family -- leaving the other family members to try to get what they want with the crumbs that are left over. Whether it's the man spending more than his share of household income on man caves and big boy games and toys, or it's the woman spending more than her share of the household income to decorate herself, the house and its occupants, neither case is fair to the rest of the family. And if left unchecked, this "my wants are more important than all of yours" attitude can eventually lead to a dissolution of the family. This is why I believe that no matter who earns the money, or who earns the most money, both parents should receive an equal amount of discretionary income (an allowance) from which to pursue their own individual wants and wishes. But for that to happen, an agreement/compromise must be achieved as to which expenditures are central to the family's best interests as a whole, and which expenditures have a sole or single beneficiary. For example, if the roof of the family home is developing more and more leaks, it would be in the best interest of the family as a whole to pay to have the roof replaced. On the other hand, paying for the cost of adding on a man cave or an arts and crafts room may serve to benefit only one household member, and therefore should come out of the beneficiary's discretionary spending money (allowance). The goal of the household should be to provide only basic food, healthcare, education, clothing and shelter to its occupants. Beyond that, an allowance should be given to each occupant for choosing which basic provisions are enough to satisfy their individual wants, wishes, and tastes, and which are not. If a teenage son or daughter needs a pair of jeans, the household should spring for a basic $30 pair of jeans. But if he/she insists on a $150 pair of designer jeans, the other $120 should come out of his/her allowance. After all, he/she is the sole beneficiary of the amount spent over and above the cost of a basic pair of blue jeans. The neat thing is, when the household is only expected to provide the bare essentials, this allows the household budget to be lowered to make room for allowances. In turn, these allowances will help to insure that each family member gets their fare share of the surplus to spend and save as they so choose -- without being persecuted for infringing on the rights of others to get what they want. Personally, I don't believe in paying allowances for chores. In my opinion household chores should be an expected trade-off for the basic essentials the household is providing to its occupants. The older the child, the more they should be giving back to the household by way of doing chores. If a child is not performing the chores that have been assigned to them, it's likely because the parent(s) is/are not giving the child what she/he so desperately desires. Kids are no different than adults. What they truly desire is to be loved, appreciated and admired. So if you're not delivering the love, appreciation, and admiration your children crave, don't be surprised if they rebel against your wishes. Sure, you do need to set and enforce the rules and chore responsibilities. And yes, it is difficult to find a balance between being an enforcer and a nurturer. But if you don't give your children what they desire most, you will likely end up with a mutiny on your hands -- no matter how much allowance you may or may not be paying them. If you are one of those parents who comes home from work all stressed out from a job that you hate but that you have financially trapped yourself in, and your first order of business is always to escape the presence of all things human, then the only way your child is going to get any attention at all from you is if they act out or fail to properly perform their chores. We need to spend quality time with them (love) and always take the time to notice and offer praise whenever they meet or exceed our expectations (appreciation and admiration). Reducing kids' allowance as a form of punishment only serves to complicate the allowance system and will do nothing to address the root cause of the problem. Children are not equipped to connect long-term consequences with present-term behavior. Your children will lose out on the opportunity to learn how to maximize the emotional returns on their income. The biggest reason I believe that paying a child a steady, dependable allowance is important is because it provides parents with the opportunity to teach their children how to manage their money. Over time you can teach them how to track, plan, spend, and save their allowance in a way that brings them the highest and most lasting emotional returns. This hands-on training helps your children to learn from their own mistakes while the consequences are less costly, instead of forcing them to learn from their mistakes as adults -- when the consequences are much more serious and ever-lasting. The thing to be aware of is that someone will teach your children how to manage their money (someone other than the public education system that is, who are graduating our children without an ounce of meaningful financial training). The question is, do you want to be the teacher of your children? Or do you want self-serving sellers and expert marketers to be their teachers? Of course, they mostly learn by watching you. So if you are a compulsive spender and a poor money manager, then they are getting bad teaching from all sides. So how much allowance should you pay your children? Well, the rule of thumb is to pay each child $1 per week for every 1-year of age. In other words, if your child is 8-years-old, then you would pay the child $8 per week for their allowance. However, this is only a rule of thumb and should not be implemented if doing so will jeopardize the household's financial stability. The best method for determining the allowances for family members is to first create a household budget that provides for basic household essentials -- including all non-monthly bills and expenses that are accruing behind the scenes. Once you have allocated funds for all basic essentials, whatever is left (budget surplus) is the amount to be used to pay out allowances to all family members based on a system of percentages. Since the parents have the most responsibility, and are the source of the income in the first place, they should receive the largest share of the surplus, with each child receiving a percentage of the remaining surplus based on their age and level of responsibility. The older the child, the more they are expected to pay for their own needs and wants, and therefore the higher percentage of the kids' share they receive. Everyone has a vested interest in reducing household bills and expenses because it leads to higher and higher allowances. Think of it as a "profit sharing" reward program for the household. If you spend your allowance for things that wear out or become obsolete, you are effectively limiting your allowance to its face value -- not too mention giving up the right to earn interest on that money for the rest of your life. On the other hand, if you invest a portion of your allowance into starting a side business doing an activity you enjoy (that's what I did back in 1997), your allowance could literally change your life for the better, forever! The bottom line? You are ultimately the one who determines the value of your allowance, not the family budget.